Creative Commons: Citizen science is the powerful idea that communities should be empowered to participate in the process of scientific inquiry, investigating the world around them and creating societal change in the process. One of the most prominent projects within the citizen and civic science movement is Public Lab, a community of individuals using inexpensive DIY techniques to act locally on environmental concerns. At Public Lab, participants are empowered to revolutionize the research process: What would it look like if collaboration started at the earliest stages of research? How can communities be involved with scientific research at all levels? From perfecting a do it yourself spectrometer to mapping and monitoring pollution emissions, Public Lab believes that environmental science can be everyone’s responsibility, and that collaboration should begin at the earliest stages of scientific investigation in order to change the way people see the world around them socially, politically, and environmentally. Public Lab is free and open for everyone to get involved. Find out more at their website. How does Public Lab view open science and citizen science as a pathway to participation in civic community? Traditional science researcher-subject relationships remove people from the inquiry process. In Public Lab, local environmental questions are asked by people living nearby, and can be explored with tools that are low cost and easy to use. Practicing open source science increases not only the number of people who engage on environmental issues, but creates the space for everyone to explore, generate data, and define the outcomes they seek. Open science and citizen science put people in the center, empowering them with tools and resources to speak substantively about their environmental concerns. Open licensing is built into all the Public Lab’s projects. In what ways have you seen open source effectively foster collaboration through open processes and licensing? Open licenses set a basic expectation of sharing. Public Lab’s friendly community norms around sharing are backed with legal structures, so participants know that their authorship will be credited and downstream contributions will continue to grow the commons. When working with community groups, open licensing is the basis for community ownership and provides a sense of security. This transparency increases conversation and discussion, which reinforces the community’s ability to pursue long-term environmental justice outcomes. Why is “open” important to the Public Lab? How do you use openness to support scientific and educational communities? Science is fundamentally about replication, and truly independent replication without openness is impossible. Closed licenses and proprietary hardware limit independent evaluation and access to knowledge. Openness has many aspects, however, and we see openness as about more than just licenses. Consider the accessibility of communications and data: Translating content out of difficult expert discourses expands the number of people who can interact with the issues and concepts. Accessible data, such as photographic monitoring, and other visual data, helps people to engage with results. So being open isn’t only about the science itself, but about making the process accessible. How does openness drive innovation within environmental science and other scientific work? It is exciting to see science today thinking a lot about openness at the publication stage with a push towards publishing full datasets and articles in the open access movement. However, there is even more work to be done at the pre-press stage. This is not just about “open source between scientists” — but a project to use the principles of open source from problem identification to publication. This helps to break down barriers between science practitioners and the public, to the benefit of both. In many fields there’s little or no open collaboration, especially with the public in other parts of the process. This has contributed to a wide gap between science practice and the public; a gap which keeps key environmental and pollution knowledge from communities which need it. When openness is the part of the focus, and communities are part of the entire process, we all work in the same space. This means that we can more easily share ideas, learn from each other, and collaboratively generate more knowledge. What kinds of projects have you worked on that have been particularly inspiring? Have you seen your work remixed or built upon by your community in any surprising ways? Balloon and Kite mapping, the project that launched Public Lab, continues to inspire. Our original case– making online photo maps of pollution sites (recent example in Picayune, MS)– has expanded to include photography and videography at protests, enhancing public discussions on the qualitative experiences of place and dislocation, and new photography rigs for panoramas and 3D scans. The spectrometry project has been through many variations, and builds. There are over 70,000 spectra from these and over 8,800 contributors. Where originally this project aimed at exploring questions such as “can I tell if this sample contains petrochemical oils?”, people have built and used spectrometers that look different and explore all kinds of other questions such as food oil fraud and the presence of organophosphate pesticides. What environmental challenges are you solving for with your community right now? How do you initiate projects? Examples of some of the challenges people have been working through on Public Lab recently have included things like: How can I measure the size of a landfill in my community, and can I determine when it has reached its capacity? Can I monitor emissions from polluters with any body sensing methods such as visual or odor monitoring, and if so, what types of violations can I catch with these? How do I capture a pollution runoff event from a development or a facility? These challenges come into Public Lab from people who bring them to the website, the online forums, and in-person events. What’s coming up for the Public Lab? How can people get involved? There is a lot of exciting activity in Public Lab right now. We are working to bring structure and strength to the research culture of the community by creating systems for publishing assistance and tool versioning. There are also new ways to interact on Public Lab with the creation of activity grids on tool pages and a new “Question/Answer” feature that’s helping people to interact and share information. 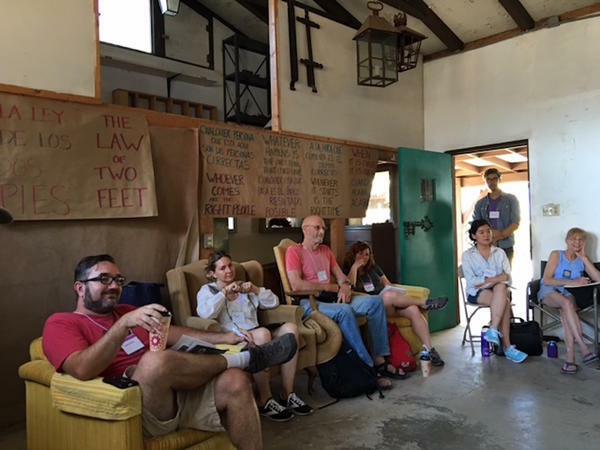 We also have a number of live spaces where people can collaborate, from our monthly OpenHour, to the upcoming Annual Barnraising in Louisiana this coming November. Everything from building the questions and the knowledge base on Public Lab, to creating the website itself is an open process that people can get involved in. Join us online or in person!